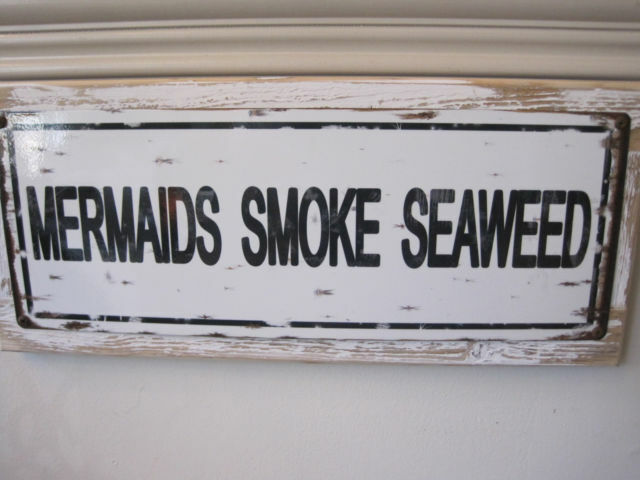 This wooden sign is perfect for any mermaid lover! The sign reads “Mermaids Smoke Seaweed” This is a totally customizable sign that can be altered with any phrase, town or song lyric. Great to hang in the entryway or on a wall or door, it is constructed of metal and wood. The very shabby chic combo of a metal sign mounted on heavy, distressed and weathered wood makes this awesome sign especially appealing. It has a white background with black print lettering. The sign is both sturdy and durable. It has a sawtooth hanger on the back for easy hanging. The sign measures 17 long by 7 1/2 inches wide. It’s very striking and makes the perfect gift for the person who has everything!